Elphilharmonie Philharmonic Hall can be Hamburg's own Sydney Opera House, says MD of Hamburg Convention Bureau. Michael Otremba joined the Hamburg Convention Bureau (HCB) as managing director in October 2016. In a relatively short space of time he’s seen a lot of growth in the German city and MICE business worth more than €706 million. He explained to C&IT why Brexit won’t harm Anglo-Germanic relations and how the Elbphilharmonie has the potential to be an icon of Hamburg. Do you think Brexit will have an effect on Hamburg’s MICE market? The UK is the third biggest source market for Hamburg, so it’s an important country for us from a business perspective. Above and beyond this however, we find that we share something special with Brits – a spirit of cooperation. Our recent event in London – Hamburg On Tour – has shown that this spirit continues and we look forward to continuing to welcome British visitors – both for business and leisure – to the city. The phrase ‘second tier city’ is sometimes used to describe cities like Hamburg. Do you consider Hamburg to be a second tier city? The term ‘second tier city‘ does nobody any favours. It has connotations of being second best and who wants to be considered as such? It doesn’t make sense to pigeonhole a city into a particular economic rank. Cities ebb and flow over time, in most cases they grow and what may characterise a location right now, may not be relevant in the future. Hamburg is a city with big ambitions and, with the current pace of inward investment and focus on future development, particularly south of the River Elbe, we have every reason to believe it will continue to grow and flourish. There’s been a shift away from marketing the accommodation and venues of a city and focussing on its areas of expertise. Do you agree with this approach and is it reflected in how HCB promotes the city and evaluates its events? Logistics still underpin a destination. Without good accessibility, good venues and good suppliers, a destination will not thrive in the MICE sector. Increasingly we are taking into account wider, socio-economic factors – the quality of living, the lifestyle and the personality of a city. I’m proud to say that Hamburg has bags of personality – it’s a city that balances its proud heritage, a busy industrial heart, along with a vibrant and sometime edgy modernity. Was the G20 this summer a success for Hamburg? Has it changed the city’s approach towards hosting major global events? As with any major event, the partnership approach works best. Hosting G20 was a product of close cooperation with the central and local government, as well as the city’s venues, transport authorities and many other organisations. Hamburg has proven that the city can successfully host major international events and there are more major events on the horizon – the Rotary Convention for example. This massive event – set to attract 25,000 people – will take place in the city in 2019. The Hamburg Convention Bureau GmbH (HCB) and the Rotary District 1890 Germany jointly managed Hamburg’s bid and are working together to welcome Rotarians to the city. In fact, we’re working with a wide range of our partners to ensure we help to make it a success. What have been some of the highlights of 2017 for Hamburg? 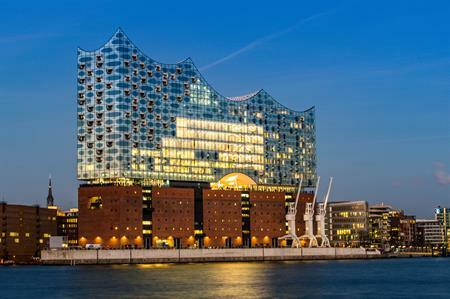 We launched a landmark building – the Elbphilharmonie Philharmonic Hall officially opened in January 2017, designed as a ‘rolling wave’ in homage to Hamburg’s world-famous harbour. This innovative venue on the edge of the River Elbe provides a truly unique meeting venue for planners and delegates. It’s fast becoming an iconic feature of Hamburg’s skyline and residents have real pride in their ‘Elphi‘. I think that – in terms of the iconic relevance –the Elbphilharmonie compares with the Sydney Opera House. Both concert halls are strongly linked with each city. When you see a picture of the Opera House, the city of Sydney comes to mind. I think our Elbphilharmonie has the strength to create this connection too.